Roli Saxena joined Clever last year to lead customer success. But in a turn of events all too common at growing startups, her role started to expand — and expand. Today, she’s running all of sales, strategic partnerships and operations. Having come up through the ranks at LinkedIn — finally overseeing its largest North American sales division — she was used to having too much on her plate. But even the most seasoned, multitasking executives have their limits. The best ones admit it. Now, with over 40 people reporting to her across multiple teams at a startup that has to remain lean and competitive, she’s gotten serious about keeping burnout at bay. In this exclusive article, she shares the key frameworks that have helped her prioritize, focus and survive during the toughest moments of her career — and suggests how startups can institutionalize them for better, happier performance across the board. To catch burnout before it gets bad, separate it into two components: 1) The factors that lead to it, and 2) The signals that you’re heading into it, or are in it already. Number one is very difficult to spot in time. “Everyone’s heard the expression ‘death by a thousand cuts,’ well, that’s what burnout is like too,” says Saxena. “It’s usually the result of many little things you think you can handle and then all of a sudden it hits you.” In most cases, you need to identify causes retroactively and learn from that. “Different people manifest burnout in different ways, but I think for all of us, it’s some variety of a shutdown,” she says. Parts of your personality start to contract. Your range of expression shrinks. Your world view narrows. “Burnout is deadly to startups because it kills perspective." Burnout is not just thinking, 'I'm too tired...' It's the inability to think creatively. She remembers how, at LinkedIn, the same people contributed ideas in every meeting while others remained silent. These people were already working hard, and were definitely smart enough to be there, but they didn’t have the ability to speak up all the time. The more stressed out they got about this, the less they participated. “This problem gets amped up at startups because things move so fast and there’s so much urgency. People and their special skills get missed,” she says. Recently, she’s been stopping discussions where certain folks have stayed mum to say, “Let me hear from you. It’s important that we get your perspective on this.” Whenever her direct reports offer up great ideas in their one-on-ones, she makes note of it, and does her best to elicit those ideas in more public forums. Making sure people can safely and comfortably make an impact will counteract burnout. Remember, the stakes involved in this aren’t low. When you can’t compete with money, the intangibles become that much more important. Being able to present and provide a workplace that tales employee sanity and psychological safety into account is a considerable advantage. “It’s a mental exercise, once you’re headed into burnout, to beat back those thoughts that you can’t possibly take a break, and just repeat to yourself, ‘No, I actually can.’” She says. It requires mental rewiring that can only come from repetitive correction. Once she recognized her triggers, Saxena felt far more confident asking for time to decompress. Early in her career, she never did. Even then, she didn’t realize she was in burnout. All she knew is she couldn’t have that conversation. Calmly, her mentor suggested that she humor herself and write down all the must-haves that would need to be taken care of before she could take a week off. On the same list, for each item, she was instructed to write down the impact the task would have on the company, and who else could possibly do it in her absence. In tech, the urgency often stems from the simple fact that all startups feel like they have to move at a breakneck pace to win. The fact is, if you HAD to be gone for a week, your company would figure it out and everything would probably be okay. So Saxena took her weeklong vacation, and she realized how much she’d been handicapping herself. “I came back and had brighter ideas. My team was happier because they felt empowered doing the things I never let them do." Two exercises in particular have proved especially valuable. This is a framework executives at LinkedIn used all the time, and now, as Saxena puts it, “Everything in my life revolves around this.” And it’s true, she even uses it to help her kids decide which activities they want to participate in (you can’t play music and lacrosse and do debate and journalism). She turns to it regularly to decide how to handle various tasks ahead of her. Quadrant 1: Tough important stuff, requiring creative strategic thinking (where you as a leader should spend your time). Quadrant 2: High yield, more straightforward projects. 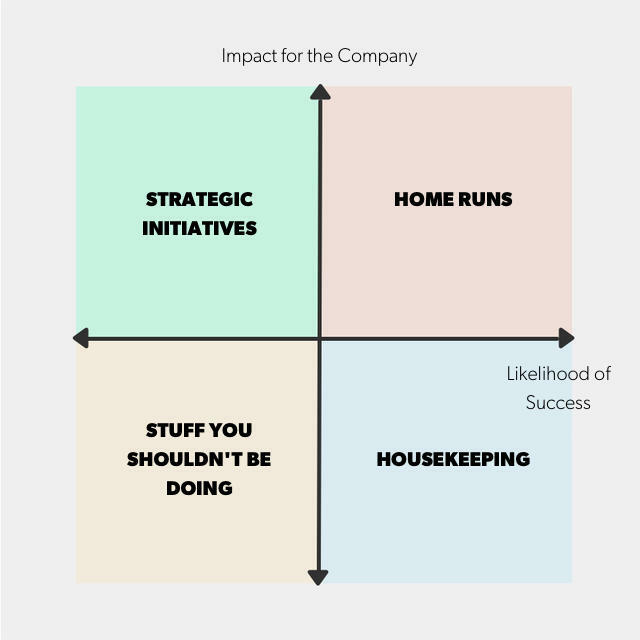 This is your home run quadrant. You can outsource this stuff to your highest performers as stretch goals that will be super empowering when they work out. Quadrant 3: Low value, low likelihood of success. This stuff should get nixed. Maybe it’s a meeting you don’t need to have, or emails that don’t merit a reply, a coffee meeting with someone less relevant to you or the company. When you’re busy, it’s the first to go. Quadrant 4: Low value, high likelihood of success. These are your housekeeping tasks. Activities in this quadrant might be best delegated or done at the end of the day. She’ll outsource anything in quadrant two to the highest performers on the team after doing what she can to set them up for success. The important thing is to be available to answer any questions or provide input when necessary, but for the most part, you can let others run the ball on these tasks if you’re a team leader. Success will be a hugely positive experience for them. If you have no one to delegate to, then maybe you allocate less time to these items. “Anytime you’re feeling overwhelmed, just draw it out. It’s therapeutic, and will give you a much clearer sense of your options and what’s truly important,” Saxena says. Column 2 usually requires an apology of some sort. Maybe it’s you telling your boss or direct report, “I’m sorry, I can’t do it.” Embracing the truth here is vital. You have to be open and honest about your capabilities. If your boss still thinks you should handle some of those items, don’t just say yes. Treat the conversation as a negotiation, Saxena says. Explain why you haven’t gotten to those projects and why you think they should either be cancelled or take a back seat or be passed to someone else. You might not win on all of them, and that’s okay. The important thing is having the conversation. Column 3 can be taken care of with a series of simple emails informing the relevant people that a task has been eliminated, or that it’s been delegated to a new person who is now the go-to. Even though you’re purging these items, you don’t want to drop the ball here. They all have to go somewhere, and it’s important that everyone is on the same page. To avoid burnout, empower your team to know they can do fewer things as long as they do them really well. Negotiation is a key part of setting boundaries. When you’re overwhelmed, you can’t be afraid to go to your boss and say, “Hey, we need to find a tradeoff here.” There shouldn’t be any cost to your performance or reputation for doing that if you're being authentic and reasonable. In fact, it should reflect well on you. Startups that want to prevent burnout will create an environment where these discussions are encouraged. Too many people say they have no room to be creative. So they just execute, and that holds companies back. Imagine your day is a jar, says Saxena. If you pour sand into it continuously by responding to inbound inquiries all day, it’s going to get filled up fast and there won’t be any room for the rocks. You won’t feel fulfilled, because your impact is limited. But let’s say you commit to focusing time on one or two rocks, and block out the time to do it. If you put a rock in a bucket, you can still pour sand in and it’ll flow around it. Emails behave the same way. The most important messages will get responded to and you’ll get more important work done. Her philosophy when it comes to email? Embrace your inner laziness. It comes back to giving yourself permission. You have to make it okay for yourself to close your inbox leaving threads hanging. Maybe even for a few days. You can prevent a lot of burnout in your org by hiring people who weather tough times in smart ways. Saxena looks for a certain set of qualities in interviews that indicate resilience, or at least good coping mechanisms. Tell me about a time at your last job when there was a huge fire, too much to do, and there were a lot of demands on your time. How did you feel? Really, what was your emotional state? Have you ever had to drop a project? How did that conversation go? Let's role play a conversation you had with your manager when you were feeling burnt out. Sometimes she’ll describe a stressful scenario with a lot of moving parts and have the person walk through the order they’d tackle things in and why and how they’d explain that to their team. In addition to hiring, Clever has leveraged its roadmapping process to keep people trained on their higher-level goals. They use an OKR system that ties everyone’s individual objectives to the few vital goals the company has in a given period. This has allowed them to over communicate about what the “big rocks” for the company are, and therefore what people’s individual big rocks should be. In every one-on-one Saxena has, she listens to what her report has been doing and will review explicitly how their activities roll up into the big company goals. If she doesn’t see a close enough connection, she’ll ask: “How does this relate to one of your three big goals?” This also allows her to underscore that anything else the person might be doing that doesn’t fit into these goals is negotiable or even extraneous. Basically, it highlights the fat they can cut if they start to feel stretched too thin. The company has also blocked out the lunch hour for everyone on staff so they won’t take meetings. They can enjoy an hour a day knowing they aren’t falling behind or slacking off compared to their peers. It gives people permission to take a mental break and maybe even come up with better ideas just through talking casually with their colleagues. This is where leading by example can have sizable impact. If top execs take that lunch hour too, everyone’s more likely to do it. Saxena has applied the same logic to working on the weekends. She knew all too well that people would do it no matter what. But by capping her own weekend work time to two hours on Sunday evenings, she’s encouraged others to do the same. “They get to feel like they’re working on the weekend, and going above and beyond, but they won’t go overboard,” she says. From 6 to 8 p.m. (before she sits down to dinner), she’ll let herself process emails, review her schedule for the upcoming week, and prep anything she needs. But that’s it. Some of the benefits of these practices are obvious: longer-term employee engagement, creativity, happiness etc. But the real advantage is that it’s forward thinking. "There’s a strong trend toward a more integrated lifestyle in tech where work never truly ends and life never truly ends." They co-exist. And when this is the case, balance is essential.